Home » Parenthood	» Veg = food = yum! My kids love vegetables…and I have no idea why. 1) We eat a lot of veg – raw and cooked. 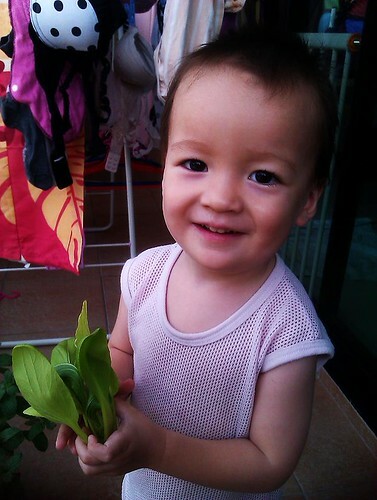 3) We grow veg and the kids help out with caring and harvesting. Prime example was today when I harvested my baby bok choy and HK choy sum. Noah helped with putting the harvested veg in a big container. He got to touch, molest, pull and basically get to know the veg on a sensory level. Later, dinner was punctuated every so often with “WAHHHHH” and “Mum mum” from Noah – they finished every single bite of veg! So yes, a rather “cheap” and educational activity like growing vegetables may also help with getting kids to eat! Look at motherhood from both sides of the coin - good and bad. Join me as I share with you my journey as a mother, as I review educational tools, toys and even cloth diapers, cook up a storm for my children, and talk about things in parenting like breastfeeding, babywearing, weaning and so much more!